The affluent neighborhood of Glencoe, Illinois is home to a curving street of Frank Lloyd Wright-designed houses reached by a single-access bridge also designed by Wright. 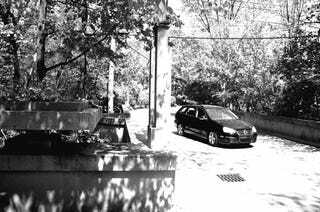 The black 2009 Volkswagen Jetta SportWagen parked on said bridge couldn't be more incongruous to the surrounding Prairie School architecture, which is recognizable by the strong horizontal lines, flat roofs, horizontal bands of windows and lack of excess ornamentation. But whereas the previous generation of Volkswagen Jetta is a faithful execution of those principles, this latest version eschews those concepts for curvaceous "me too" styling that's more Toyota Corolla than Francis C. Sullivan and an unmistakable chrome grille that's more Paul Wall than Alfred Caldwell. And not for the better. Though I find this move disappointing, the indistinctness of the Jetta is mostly inoffensive and in SportWagen form the car loses the dorky symmetrical greenhouse for a slightly angled beltline that finishes with a thick pillar a la Cayenne. If you're into the sort of thing. And even if you aren't, as with the houses, you'll be spending more time inside enjoying it than outside staring at it. In my case this "enjoying" means the fun of toying with solid German engineering and not the pain of trying to lounge in the specially designed though miserably uncomfortable Wright furniture. The inside of this car is a comfortable place to be even though this particular SportWagen was the basest of base models, equipped with a five-speed manual transmission and the 2.5-liter inline-five engine. Volkswagen likes to tout the fact that this engine is half of a Lamborghini V10 (they share a head-design) which is true in the way that ELO Part 2 was half of ELO. Despite its over-hyped origin the 170 horsepower and 177 lbs-ft of torque provide sufficient power. Those not content with sufficiency will have the option of the 2.0-liter turbo or 50-state legal TDI fourbanger when the car goes on sale in a few months. Driving home from Target with a load of soymilk, toilet paper and the assorted basic needs of a modern life the VW encouraged confidence with enough power available to get me from stoplight to stoplight without worrying I'd find a lead-footed cabbie in the spacious hatch. However, while trying to sprint up a long highway onramp I nearly ran out of room before having to give way to a Compact SUV. Racing down the highway to reclaim my manhood, in a wagon no less, I was able to smoothly guide the quickly yielding shifter into third before it ran out of breath. I guess I could take comfort in the fact that with nearly 67 cubic feet of storage space the Jetta could easily haul more gear than the SUV. I felt better when the Jetta reached the outer limits of Cook County along a stretch of road leading up to the aforementioned Glencoe, one of the locations used by John Hughes in Ferris Bueller's Day Off to represent upper-class comfort. All of a sudden the monotonous straightness gives way to a patch of road that doesn't stay straight for longer than 60 yards and includes a number of blind curves. Though there was a suggestion for lower speed, the Jetta shrugged it off. This generation features an independent suspension at all corners, including a rear multilink setup "borrowed" from Ford's capable C1-platform (they hired the same designers), which I was easily able to put to good use charting a sharp, fast line like a caterer late for a Junior League tea. Weaving my way past the carefully manicured lawns and opulent homes it struck me that any shortcomings could be easily forgotten if you consider that this is a well-built, well-handling and attractive station wagon with German heritage and a manual transmission that should sell for somewhat less than most of these people spend to send their bratty kids to preschool (we hear close to $20K when it goes on sale). Say what you will about the relatively bland new look, the 2009 Jetta SportWagen feels both unique and structurally sound. That's more than we can say for all of Wright's work. The famous Fallingwater may be one-of-a-kind, but the property has been saddled with problems ranging from rampant mold to balconies that started to bend due to insufficient reinforcement. That small detail and the general progression of taste meant the enclave of Prairie-style design in Glencoe is a historic neighborhood, no longer replicated. And with the impending demise of the Mazda6 wagon in North America, the SportWagen could be the last of a dying breed of fun, relatively cheap wagons.